Read to the end to find out how you can win Thai for beginners for your iPhone, iPad or iPod Touch this week! When I first started my Thai Language learning journey I did so with my trusty Thai/English/English/Thai dictionary from Benjawan Poomsan Becker and it served me well during my first 2 trips to Thailand but it was obvious by my third trip I needed a lot more help if I was going to actually speak the Thai language. It was then that I started looking into books that might teach me the basics of the Thai language. One of the first books I found Happened to be written by Benjawan as well and it was aptly named, Thai for Beginners. The great part about the book for me was it came with tapes so I could follow along with the lessons and actually hear the correct pronunciations and playback sections I was having trouble with. Thai for beginners really pushed me in the right direction and I found I was gaining a much better understanding of the Thai language than I anticipated. It’s been a few years since I first opened Thai for beginners but this is the one book for me that laid the foundation for learning Thai as I am sure it has done the same for many others. I really can’t say enough good things about this book or it’s author, Benjawan Poomsan Becker, the thought and time put into this book and others in the Paiboon Publishing stable of Thai Language products is clearly immense. If Thai for Beginners wasn’t already good enough now Paiboon Publishing has released it as an iPhone, iPad and iPod Touch app that you can conveniently carry around with you anywhere you go. Having the Talking Thai/English-English/Thai Dictionary on my Ipod I can testify to just how well Paiboon Publishing has done transferring their library to the Apple apps and have no doubt the same care and consideration was taken moving Thai for Beginners to the app store as well. Hearing the spoken Thai will help you increase the speed of learning the language that no book alone can do. Paiboon’s system of transliteration shows you how the Thai words are pronounced using English letters so you don’t have to be able to read the Thai script. Follows the same clear step-by-step instruction, which builds on what has previously been learned. Test your ability to hear and understand Thai with the built-in interactive exercises. This app allows you to learn Thai to a great degree before you exhaust its usefulness, since it even teaches how to read the Thai script. Money well spent. You’ll find many new opportunities to practice your Thai since your iPhone and iPod Touch will be with you all the time. This app teaches you the language skills of speaking, listening and reading Thai. The lessons follow the format of the Thai for Beginners book, but a real Thai male and female voice speak the over 3,000 words and phrases, alternating between male and female pronunciations. Hear a phrase over and over until you can say it correctly. Just click on it. Provides examples of the five tones in Thai: low, falling, high, middle and rising tone. Test your ability to hear and understand Thai with the built-in interactive exercises. You can retake the exercises after studying and improve your score. An advanced level feature allows you to turn off the automatic spoken word so you can test your ability to read the Thai script. Contains many additional useful words and phrases not contained in the book. Sounds pretty good doesn’t it? Well, it is and it’s definitely worth every penny of the $24.99 price. 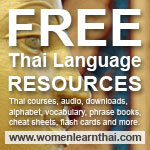 But what if you could get Thai for beginners for your iPhone, iPad or iPod touch for free? Sounds even better now doesn’t it? Well, you can get Thai for beginners for free, because Thailand, Land of Smiles is giving away 5 copies of Thai for Beginners this week. All you have to do is comment on this post and tell us what you’ve been doing to learn the Thai language, what tips you might have or what programs you have found useful…it’s as easy as that. On Sunday July 10th I’ll gather all the comments ( yes, multiple comments all count ) and put them in a hat and have a beautiful assistant draw 5 winners names that will receive the Thai for Beginners iPhone, iPad and iPod Touch App absolutely FREE! I had a dream: wining this fantastic application… best of the bests ! Thai for beginners was the first Thai language book that I ever bought. Unfortunately, my copy didn’t come with any audio material. Although I now have other books and have advanced beyond some of the book, I still go back to it for reference. After my time studying Thai, I have to say that the best advice I can give is learn to read and write in Thai. You may advance quicker in the beginning solely learning to speak Thai, but if you have a strong foundation of reading and writing, your Thai learning will go so much faster. Living in Thailand is also very useful. Now would you believe it, only was only today that I bought an Ipod touch to take with me to thailand. This would be perfect as I plan on starting to learn some Thai soon. How much Thai do you speak Talen?? So, Talen, I can imagine Thai for Beginners will be even more valuable. my thai is still minimal after over 20 years of trips but i don’t have an i phone or a pad so saving 25 dollars would actually cost me a lot more money to use it. I’ve also purchased the previous Thai dictionary app. I’ve found that app to be very comprehensive. If I don’t win a free app here I’ll probably purchase this new app as well. Was there any reason why this new app doesn’t list Paiboon Publishing as the seller instead of listing Dominique as the seller? I initially did a search on Paiboon Publishing and didn’t see this app listed. I am new here… I’m starting my 3rd month in the LOS, having recently retired. For learning Thai, I have been going to YouTube. About 5 months ago I decided to leave my comfortable job in the insurance sector in South Africa to become a teacher in Thailand. Fast forward to the present – I work for a TESOL training and placement company in Thailand and I’m having a blast. I have already made many Thai friends. Every month we do a community outreach where we teach English to poorer or disadvantaged Thai kids (between 7 and 12 years old). I relish working with these kids as I use it not only to teach them some English, but also to have them teach me some Thai. It’s absolutely awesome to be part of it. This helps me improve my Thai, albeit very slowly. To work on my Thai I often make notes of new and useful Thai words/phrases in my iPod touch. I also use a dictionary (TTT “The Thai Translator”) I found on the Apple App Store quite a lot. This is a great blog! Keep the posts flowing. I recognized the book, it was the one my mother gave me the past xmas (But I didn’t get the tapes either). To tell the truth I haven’t used it much, my Thai wife borrowed it and is using it to help her with her English. One thing I remember is that it tries to encourage you to learn the alphabet as well as the spoken word right off the bat which is different than how you learned. As far as I’m concerned, with six trips most of the words I know have something to do with food which I guess says something about me. The problem with learning Thai for me is that when I travel to Pattaya I don’t really need to know any Thai as so many already speak english, and when I’m out of Pattaya my wife does most the talking or translating for me. I hope to pick some more Thai up before I go down at the end of the year but it’s kind of been like a New Year’s resolution, it never gets done. About 20 years ago we used Benjawans ‘Thai for Beginners’ in Thai classes. I could read and write quite a bit after these classes. But I have to confess that I didn’t really use it a lot, so forgot most of it again. Thaigolfer, well maybe it’s time to start again, especially if you win this app. Rambone, learning Thai definitely opens upo a whole new world when in Thailand…it’s always nice to know whats going on around you. This App along with the Thai/English-English/Thai dictionary app together would really help you learn a lot more easily. Yinzerk, this is definitely another great Thai language app to have. Not sure where you saw anyone other than Paiboon Publishing as the seller as both their page and the itunes app store lists Paiboon as the creator/seller. Arch, you should really get an iPod Touch they are very reasonably priced and hold a lot of music and apps. I currently have over 4000 songs and 25-30 apps installed and still room for more…great little device. Rick, the Thai/English-English/Thai dictionary really is indispensable, like you I use it daily and I think the Thai for Beginners would be a great companion app. Great stroke of luck for you…good luck you just might win. And definitely check out the Thai/English-English/Thai dictionary it’s really worth the money and is an excellent Thai language resource. I have been in Thailand just over two years. I have tried learning basic Thai at two schools and get overwhelmed with the material and forget most of it very quickly. It certainly would help having an I phone application, so I would have a dictionary with me at all times (in my phone) instead of carrying around a phrase book so I could try and communicate when I am out in the community. Daran, yeah it can be tough at times talking to new people and they don’t get what you are saying when wives, girlfriends and friends you have known are used to hearing you. Lawrence, excellent advice…if you can read Thai you can speak Thai and this book goes a long way in bringing it all together. Dominic…good luck you just might. Sometimes my Issan in-laws will sneak in Lao words in as well (sep vs arroy – delicious), it seems they can be quite interchangable in that area of the country. It has come in handy in the US for my wife as a few times she has run into people who speak Lao but not Thai. I am going to Thailand for the first time this summer and would love to win this app and get a head start on some Thai language skills. Talen, what a great write up. Excellent. I wish that I’d gone with similar instructions. What I came up with was… shite… or rather, asking people to not post shite. Anyway, those who didn’t win have another chance at this app. Just follow the link below and the instructions as well.